The Tenerthor are a race of elves which may be used for player characters. For additional information regarding this race, read their entry in the creature compendium. Presented here are guidelines for the play of Tenerthor characters. Tenerthor player characters are assumed to come from the lower caste of the Tenerthor society and not from the noble Cailis caste. Tenerthor, called wild elves by some, called the barbaric elves by some elves, are a free spirited and independent race of nomadic clans. They are brave, willful, and friendly. Tenerthor enjoy exploring new places, so much so that they become restless if they remain in the same place for too long. This causes them to wander about the lands, seeking new experiences. Most Tenerthor are forthcoming and exactingly blunt - if something needs be said, you can trust a Tenerthor to say it plainly and true to how they see it. Other races sometimes find this bluntness to be somewhat annoying at times, dwarves, however, find it to be amusing. The easy manner with which the Tenerthor speak of the most intimate or horrific topics are all part of their belief in open acceptance of each other and their path of life. Tenerthor rarely make long term plans and tend to stay with an occupation or pastime for only as long as it suits them. Being elves, tiring of a subject may take a Tenerthor several decades, but most other elven races still think the Tenerthor to be whimsical and unfocused. Their spontaneity and zest for experience sometimes can be overwhelming for those unused to the Tenerthor ways, but the fierce companionship and valor with which these elves conduct themselves makes their presence powerful and appealing. Tenerthor elaborately decorate their bodies with tattoos, piercings, simple "jewelry" woven into their hair, bracelets, paints, and hair dyes. Each is different from the next. These decorations serve to tell of the elf's history, stories, beliefs, social standing, and more. With a trained eye, one can learn much about a Tenerthor elf just by looking at how they decorate themselves. A minimal of scantily made clothing is typically worn - often fabricated from animal pelts or weave. Tenerthor are wiry and taller than other elfin races, they also tend to be stronger and more rugged. Underneath, or highlighted by, their painted bodies most adult male Tenerthor have numerous scars crisscrossing their bodies. Their hearty and dangerous lifestyle has bred them to be more healthy and sturdy then their other elfin cousins. They have strong jaw and cheek lines from the tough dried foods, nuts, and stringy meats which they eat. The Tenerthor tend to have dark features. Their eyes range from a light almond to a deep black. Their bodies, what skin can be seen, is strongly tanned and weathered from exposure. Their hair grows down from the tops of their brows, long below the neckline, is typically black or brown colored, and is filled with trinkets. For base height in inches roll 3d4+60 for males and 1d12+58 for females. For base weight in pounds roll 115+5d12 for males or females. There are, of course, those Tenerthor who do not fall within these guidelines. However, great height, shortness, or obesity are rarities among the race. When rolling for starting age of a Tenerthor player character, roll 86+4d12. Since they lead active lifestyles through-out their lives, the onset of old age is slightly slower for these elves. When rolling max age roll 4d100+350. Tenerthor are considered adults at an age of 90 years, middle aged at 200 years, old at 300 years, and venerable at 350 years of age. While other elfin races call the Tenerthor barbaric, most other civilized races find them to be companionable and hard working - if not somewhat eclectic. The Lerether elves call them their lesser (and cruder) brothers, even though many sages speculate that the Tenerthor may be the original elfin race whose travels seeded the world with the other scattered elven races. When this is mentioned to a Lerether, they typically respond that they have "risen above these primitive nomads". The Tenerthor are hardly primitive though - being uniquely skilled artists, musicians, storytellers, visionaries, hunters, and sorcerers. The other elfin races graciously accept the Tenerthor among their kind, lest they suggest that there exists an elfin race only fit to dwell among the other races. Of all the elves, the Tenerthor and dwarves get along the best. Sure, the dwarves find the excessive body-art and typical elfin passion for the out-of-doors to be annoying, but they admire their honesty, dedication, fine warrior skills, and fearlessness. Don't be silly though and assume that any dwarf would prefer a Tenerthor over their own dwarven companions. Gnomes and Halflings both find the Tenerthor to be amiable. Halflings take great amusement at the Tenerthor's sense of honesty, while gnomes appreciate their sense of adventure (even if they don't have any practical mechanical skills). Most humans just think the Tenerthor are another clan of elves that dress funny. What the humans don't realize though is that many Tenerthor believe them to be the dirtiest and ecologically insensitive among the "civilized" races of the world. Haruninki and Tenerthor also don't get along fabulously well. Tenerthor find them to be too staid (even more than dwarves!) and concerned with social station. The Haruninki, on the other hand, think the Tenerthor are irresponsible trouble-makers and loose-tongued rogues. 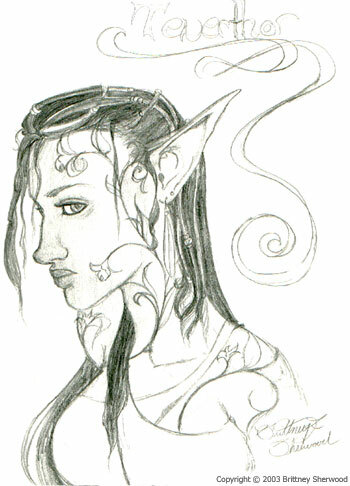 Tenerthor, perhaps a little more so than other elfin races, lean towards the gentler side of chaos. There are few laws that govern their way of living and most simply follow the "Golden Rule": Do unto others as you would have them do unto you. Most Tenerthor are good hearted. There is, of course, the occasional "bad-seed" or troublemaker. typically this results in banishment from the clan. The bulk of Tenerthor civilization comes from the eastern side of the formidable Evermounts. There they live in the untouched wild, separated from the rest of the world. There are scattered nomadic Tenerthor tribes that wander the rest of the world though. These are thought to have been founded by Tenerthor left behind in ancient times when the race wandered the whole of the planet. That, or that they are the descendents of Tenerthor who were banished and sent across the Evermounts as a punishment for their crimes against the clans. Tenerthor live in easily dismantled lean-tos and tents, rarely staying in one place for more than a month or two. They rotate through lands, following the good hunting during most of the year and making winter camp in the lowland woods. Any Tenerthor belongs to one of the great clans. The clans are known as: The Forest Wards, The Sun Chasers, The Night Moons, and the Ice Lords. Other clans may exist but are still unknown. Each clan is led by a ruling class called the Wintran Cailis, whose job it is to maintain the vast citadels that they dwell within. The Cailis, unlike the vast majority of Tenerthor are not nomadic and lead a very different lifestyle. For more information on the Cailis, see the Tenerthor's Creature Compendium entry. Tenerthor rarely take up the standard of a specific god, believing no one god worthy of complete worship. Like demons and other powerful spirits, gods are a thing of legends and stories, which the Tenerthor have plenty of. Gods are not things to be worshiped, but rather have the same lusts, emotions, and frustrations as mortals, only on a godlike scale worthy of many adventurous tales. One would probably not recognize the names of these gods as the Tenerthor are prone to rename things as they see fit, and gods, being impressive beings, have an impressive number of names that the Tenerthor call them by. When a Tenerthor does feel the calling to worship a particular god they often choose one of the deities that have some part in the natural world. Chishleen, Baeast, and Illustree are common choices. The Tenerthor east of the Evermounts speak the native tongue of their clan and sometimes one or two other clan's languages. Some Tenerthor also speak Vala, "the first tongue," but usually only academics bother to learn it and academics are rare in the Tenerthor. Tenerthor not from beyond the eastern side of the Evermounts sometimes speak a heavily changed version of Vala or whatever language is common to the part of the world where they roam. Tenerthor names, as with other elfin names, are musical and flowing. The Tenerthor also possess a simple pictorial rune language which they use to facilitate the remembering of their lore. Cailis use a more intricate and complete written language to keep track of the Tenerthor's lore and history. Tenerthor are fond of giving a multitude of names for the same thing or person. They have their own sense of what kind of name sound fits each thing and other Tenerthor can understand what a Tenerthor is talking about, not just by knowing it's many names, but also by the context and sounds used in the name. Most Tenerthor adults have somewhere between six and twelve names that they commonly answer to, and many more from their past which they don't use any longer. Nearly any significant occasion in a Tenerthor's life can be the cause of gaining a new name. Time and changes in personality, profession, or tribe are all occasions for a name to fade into disuse. Tenerthor, unlike most races, do not hold any more sentimentality for a given name that they have than one might hold sentimental value for a good meal. This can make tracing the family lineage of a Tenerthor difficult and frustrates non-Tenerthor sages that try to catalog the race's history. Common male Tenerthor names are Thrinias, Enborion, Angron, Arammir, Celebrindil, Denelthil, Thadanor, Brillin, Amredhel, Mangorn, Gendaltor, and Caranrolloth. Common female names include Alriel, Amratha, Laeriana, Elimiri, Forwornne, Maglagail, Elessa, Syelcemmildë, Larannerin, Selya, Arvanya, and Aeändi. Tenerthor are natural adventurers, filling the roll of Sorcerer, Bard, Ranger, Druid, Barbarian, Monk, and Fighter equally well. They are good travelers and well experienced at surviving in the wild. Tenerthor go adventuring to seek out new experiences, but may also travel for nobler causes and to do good among the lands. Tenerthor, while possessing the same grace had by other elves, do not usually make good rogues - they just have too many odd trinkets hanging from their body and jingling with every movement and dress too odd to avoid attracting attention to themselves. +2 Constitution, +2 Charisma, -2 Intelligence: The Tenerthor are an athletic and nomadic culture, accustomed to the rigors of traveled and outdoor living. Tenerthor develop a healthy constitution early on in life. Tenerthor are also a friendly and charismatic race, despite their oddness. Their culture encourages sharing and cooperation among its young. On the other hand, Tenerthor place little importance on a formal education and, except for the upper class Cailis Tenerthor, believe that a refined and trained mind blinds one to the subtle wonder of nature. Medium-size: As Medium-sized creatures, Tenerthor elves have no special bonuses or penalties due to their size. Tenerthor base speed is 30 feet. Low-light Vision: Tenerthor can see twice as far as a human in starlight, moonlight, torchlight, and similar conditions of poor illumination. They retain the ability to distinguish color and detail under these conditions. +1 racial bonus to Bows: As children and through adulthood, all Tenerthor are trained and are expected to use bow weapons for sport, hunting, and show. When using bows the Tenerthor gain a +1 bonus to their attacks due to their training, steady hand and superior eye precision. All Tenerthor are proficient in longbow, shortbow, and composite bow use, regardless of character class. +2 racial bonus to Move Silently, Spot, and Survival: Tenerthor learn at a young age to move quietly so as to be a better hunter and they spend their lives living outdoors. Pass Without Trace: A Tenerthor can move through outdoor environments with such careful movement that they leave no sign of their passage. Traveling in this manner lowers the Tenerthor's movement rate to 20 feet and requires a successful dexterity check, improved by their Move Silently modifier and altered by their Armor Check penalty, against DC 15. A successful check indicates that the Tenerthor has left no tracks to mark his passage. Favored Class: Ranger. A multiclass Tenerthor's ranger class does not count when determining whether they suffer an XP penalty. +2 Constitution, +2 Charisma, -2 Intelligence: Tenerthor are an athletic, nomadic culture accustomed to the rigors of outdoor living and share a rich culture of cooperation, but place little importance on formal education and believe that an indoctrinated mind blinds one to the wonders of nature. Tenerthor are Medium creatures and have no bonuses or penalties due to their size. Tenerthor have a base speed of 30 feet. Low-Light Vision: Tenerthor can see twice as far as humans in conditions of dim light. Elven Immunities: Tenerthor are immune to magic sleep effects and get a +2 racial saving throw bonus against enchantment spells and effects. Elven Magic: Tenerthor receive a +2 racial bonus on caster checks made to overcome spell resistance, but lack the innate sense of magical craft that some other elven races possess and have no bonus to identifying the properties of magic items. Weapon Familiarity: Tenerthor are proficient with longbows, shortbows, their composite varieties, and any weapon with the word "elven" in its name. Trackless Step: Tenerthor leave no sign of their passage when traveling in natural environments. Hunter's Guile: Tenerthor receive a +2 racial bonus to Stealth and Survival checks.